The 2018 Churchwide Gathering of Presbyterian Women will be held Aug. 2-5 in Louisville, KY. 2018 is also the year that PW celebrates its 30th anniversary! 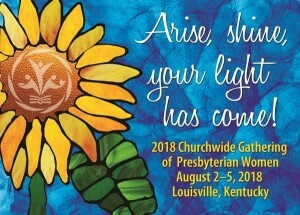 Seeking financial assistance for the gathering? The grant deadline has been extended. A limited number of leadership development grants are available to help with gathering costs. These reimbursable grants will cover up to $500 in gathering registration, housing or travel expenses. The deadline for applying has been extended to May 1, but early application is encouraged. First-time gathering attendees will receive priority consideration. More information, including registration, is available here.